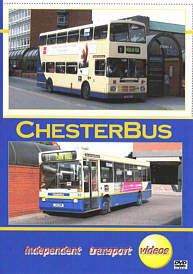 ChesterBus was the new identity and livery introduced by Chester City Transport in 2005. Moving away from the traditional maroon and cream worn by the fleet since the late 1940’s, a modern scheme of blue and cream with yellow trim was chosen for this smart council owned bus company. This video programme records the fleet over a period of three years. We start our journey around the historic city of Chester at the busy Bus Exchange near the Town Hall on the Market Square. From there we head along the Inner Ring Road which was opened in 1966 to relieve the busy streets of ever increasing car traffic. We then go along Delamere Street and see the closed and boarded up bus station in the background. Now we head into the city, under the historic Northgate and busy Northgate Street. After some filming on Cow Lane bridge we visit Frodsham Street and Foregate Street. There is plenty of bus action, illustrating the current single deck fleet made up of Dennis Darts with both Plaxton and Marshall bodywork, Wright bodied Scanias and BMC Falcons. Double deckers are Leyland Olympians with Northern Counties and Alexander bodies. There are also 6 Daimler Fleetline open toppers, all former CCT vehicles in the livery of City Sightseeing. We visit the Newgate and see the buses running along Pepper Street before making a call at the picturesque Old Dee Bridge. From the tranquillity of the River Dee we then film action along The Bars and City Road. At the end of City Road is the former Tram Depot with tram tracks still in evidence and currently the home of ChesterBus. We had total access to the depot in August 2005. Filming a busy morning as vehicles were leaving and maintenance jobs taking place. No Chester video would be complete without a Guy Arab! We are pleased to present a short film shot by Dave Anders in the late 1970’s, as well as some cine footage from our own archive. On 2nd July 2007 came the news that Chester City Transport had been sold to the First Group Plc. Thus ending 105 years of council owned public transport in the City of Chester. This video programme is a fitting and timely memory of this proud municipal bus fleet.